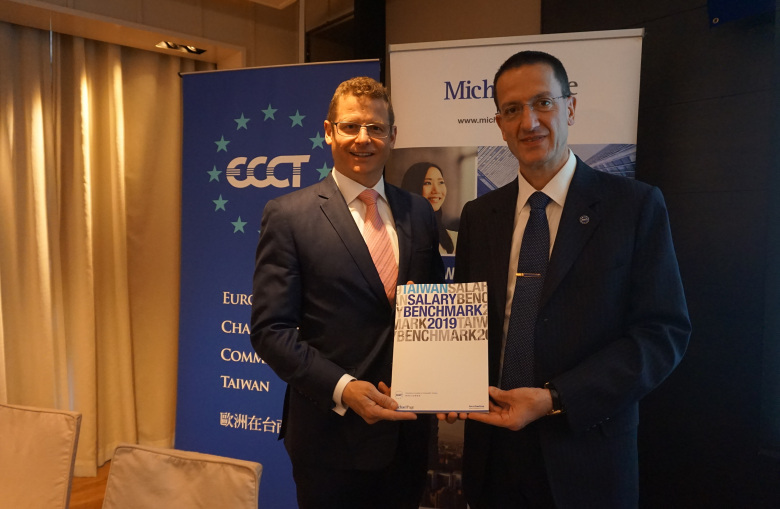 The annual report, produced by Michael Page in cooperation with the ECCT, was released at a Premium Event lunch. A summary of the report’s highlights was presented at the lunch by the guest speakers Mark Tibbatts, Managing Director, Southern China & Taiwan, PageGroup and Claire Wu, Associate Director, Michael Page. After the lunch the report was released to the media at a press conference. The report provides an overview of market and employment trends in 2019 across major industry sectors and features insights into employment conditions, key employment skills in demand, sector trends and salary benchmarks in Taiwan. In his presentation Tibbatts gave and overview of industry trends and some highlights of the report while Claire Wu gave some in-depth details of trends in specific industry sectors. The report notes that an average of five job seekers were interviewed before a job was filled and it took about two months for a hiring manager to fill a job while jobseekers had to attend three rounds of interviews before securing the role. Most of the sectors which the firm is engaged in saw an increase in the number of jobs posted over the past 12 months. For example, the report indicates a 12% increase in the number of technology jobs posted in Taiwan in the last 12 months. Moreover, jobseekers can expect an average 10-15% salary increase when switching jobs, indicating a talent shortage and competition for talent in a number of areas. Given the market conditions it is not surprising that 74% of jobseekers perceive the job market to be good and 71% of them are optimistic about receiving better remuneration. Tibbatts noted that the energy sector (especially renewable energy) has created many exciting new job prospects, which has been helped by the government’s strong support of the industry. Given the lack of sufficient talent in the sector, the government is relaxing regulations to allow in more foreign talent, such as offering short term visas. If further relaxations are implemented, it will benefit other industry sectors as well. Given the great talent shortage, jobseekers in the sector can expect a 17% average salary increase when switching jobs. Tibbatts also highlighted the technology market, which he said would be very active in the year ahead, particularly within the Internet of Things (IoT), cybersecurity, ecommerce, Fintech and block chain areas. He noted that Taiwan is a recognised centre for software development talent, particularly for multinationals targeting mainland China. For this reason technology employers in Taiwan will face tough challenges in the talent race. Therefore being strategic in attracting and retaining top talent is key. Providing a competitive salary package, building a strong employer brand and establishing efficient recruitment processes will make the difference, he said. Tibbatts said that the technology market will remain talent-driven with excess demand, especially for positions within the artificial intelligence (AI) and big data landscape in 2019. Many top candidates are likely to receive multiple job offers. With increased use of data-driven decision making, companies are also hiring data engineers, machine learning scientists and data scientists to implement business strategies. Tibbatts concluded with some thoughts about how to attract and retain talented millennials and how to adapt to the rise of artificial intelligence. He made the point that companies need to determine what machines do well and what humans do well and it is the job of leaders to work out how to integrate human-machine functions and services effectively. It is also important to find individuals who understand both technology and business, which he admitted is not always easy. When companies find people with these talents, they should build teams around them. He made the point that digital transformation is vital but a lot of companies have wasted a lot of time and resources by not planning their digital transformation properly. On the subject of diversity and inclusivity, he made the point that diversity goals have moved far beyond simply a CSR or marketing issue to become a central topic in the global employment landscape. He expressed the view that every company needs to prioritise achieving diversity or else struggle to attract good talent and customers. Leaders also need to systematise their flexible workforce. Tibbatts noted that already 12% of Taiwan’s workforce are independent workers. Millennials don’t want traditional office designs and technology infrastructure and fixed working hours. Moreover, they care more about experience than money. Employers therefore need to offer more flexible working conditions as well as make their workplaces friendlier.